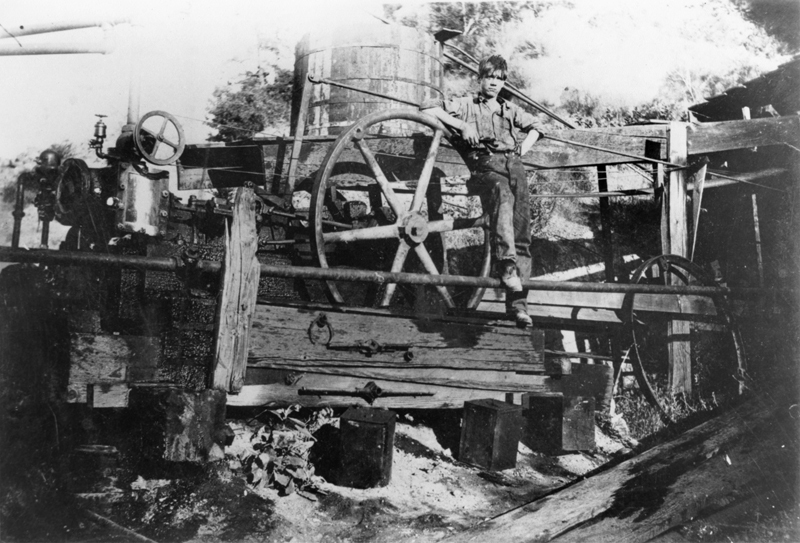 An unidentified youth leans on the jackline hookup at the CSO jackline plant deep in Pico Canyon. According to historian A.B. Perkins in 1962, the youth is Pico resident Merle Cook, and the photographer was Cook's mother, Barbara Sitzman Cook (wife of Charles Sitzman, superintendent of the Pico oil field from 1927-1937). However, Merle Cook in 2017 said it isn't him, and his mother wasn't the photographer. The photo dates from the 1920s-30s. Jackline plants were steam-powered engineering marvels that drove the oil pumps via a network of cables stretching out over Pico Canyon. Perkins called them jackplants. According to Nanette Lagasse Gaither, daughter of Pico oilman Frenchy Lagasse, they were called jackline plants. The darndest single spectacle of an old oil field was the jackplant. The more one watched it in operation, the more one wondered whoever had the nerve to suggest such an anomaly in the first place, and the patience to assemble it. There's quite a lot of pumping for production in oil fields. Today, nice little electrically operated, or gas operated engines are installed on an individual well and then forgotten until a sanding job, or the natural cussedness of mechanical objects, brings it to mind. 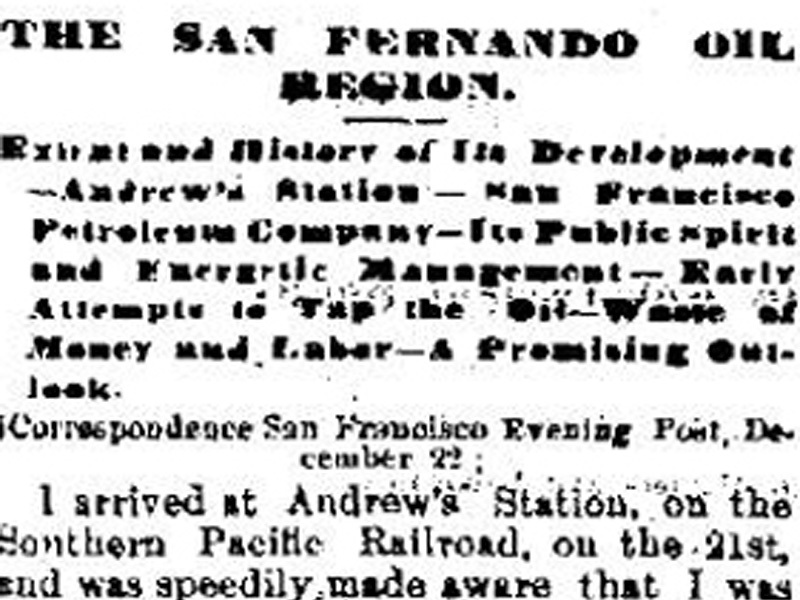 Back in 1880, power was steam. 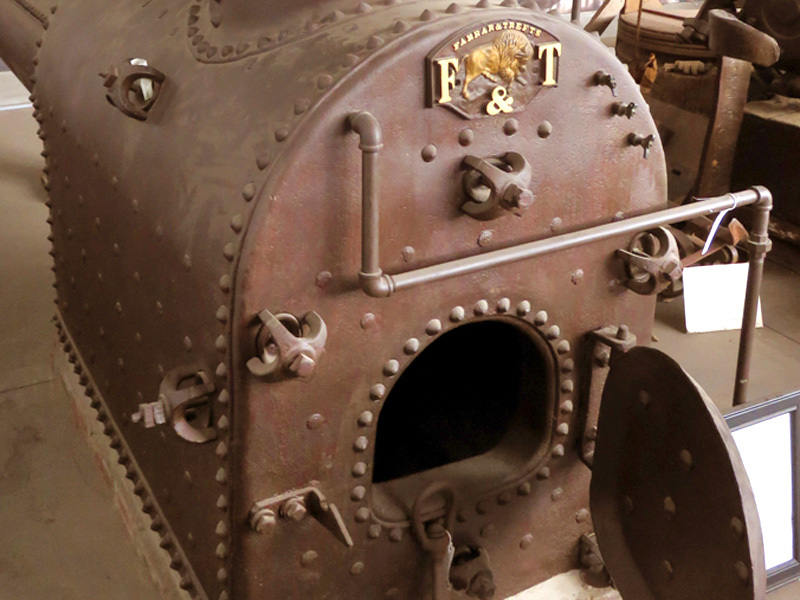 So you tucked a firebox boiler back in the brush and set up your jackplant. At best, it was a weird, designed to go in all directions at once. At worst, it was a horrible nightmare. You had a couple of eccentric plates, with about 18 holes, or eyelets in their rims, in which the cable hooks set. As they proceeded agitatedly through their pre-conceived, conflicting orbits, their cables, tightening and loosening, powered the well pumps. This CSO jackplant pumped about 15 wells on the CSO hill. [This] view shows Merle Cook sitting on top of the jackline hookups. Below is the geared wheel, and the bull wheel transmitting power from the 35 HP steam engine. Abandoned, well CSO No. 6, is just beyond the plant. [...] Problems in couterbalance were solved by suspending little wooden platforms, maybe rock loaded, as necessary. As the cables radiate wherever from the jackplant, it is a perfect example of "going all directions at once." Over on the PCO hill was another such plant. In 2004, Merle Cook donated a treasure trove to the Santa Clarita Valley Historical Society  all of the scrapbooks, Alex Mentry's original 1887-89 time sheets for the oil workers, Felton school programs and report cards, oil well production reports and other items that Cook's mother, Barbara, had saved from Pico. Sitzman's Mentryville Collection Comes Home by Patti Rasmussen, 2-15-2004.